Flemish painter and draughtsman. He received his training as a painter from two of his uncles, Jacob Bol and Jan Bol. 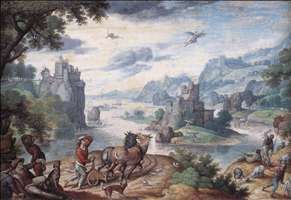 After two years in Heidelberg, he was made a master in the Mechelen Guild of St Luke. 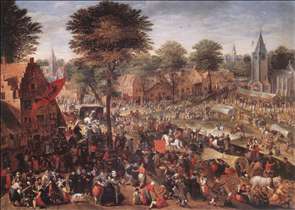 After the annexation of the city by the Spanish troops in 1572, Bol settled in Antwerp, where he became a master in 1574. A decade later he left Antwerp, arriving in Amsterdam after travelling to Bergen-op-Zoom, Dordrecht and Delft. 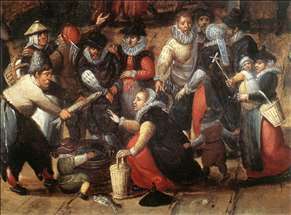 Van Manders statement that he was buried in Amsterdam on 20 November 1593 is disputed by some sources because of a supposedly signed Adoration of the Shepherds dated 1595. Bols most important students included his stepson Frans Boels, Jacob Savery and Joris Hoefnagel. See more details about "Village Feast (Annual Fair)"
See more details about "Village Feast "
See more details about "Landscape with the Fall of Icarus"